We've seen it - is Sky the limit for 3D? There were more people than normal seeing double in pubs up and down the UK yesterday, with some lucky football fans watching the Super Sunday clash between Arsenal and Manchester United in Sky 3D. This has already been a significant tie in the tech calendar as it was also the match chosen to be the first to be shown in HD, some year earlier. With the complete success HD has had in the home, the stakes are high for 3D to make the same sort of impact. TechRadar were lucky enough to be at the Slug And Lettuce in Islington – London, Manchester,Cardiff, Edinburgh and Dublin were the host cities – where one of the 3D matches were shown and we were initially impressed. Not convinced... but impressed. There is no shock and awe factor with the new wave of 3D. While we did duck a few times when the Sky graphics swung past on the screen, the game itself is shot in a more subdued way. There are no balls flying to the camera, no in-your-face goal celebrations. The 3D brings added to depth to proceedings. This can be seen within the advertising hoardings and the back tier of the crowds – everything is given a much better sense of perspective. As with any nascent technology, however, there are problems. LG provided the TV screens for the match in all the pubs and while 47 inches is big enough for 3D in the home, on a crowded and rather long pub floor, the 3D effect is almost non-existent from the back of the room. There is definitely a sweet-spot that only a few lucky punters managed to hit by sitting close to the screen. The rest of us were left wanting more. 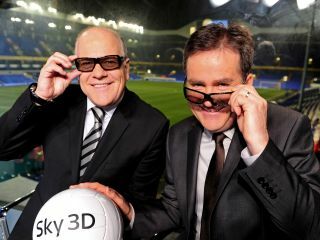 Sky provided a separate commentary for the 3D feed of the match; this is something which may sit uneasy will football fans that are used to hearing the dulcet tones of Andy Gray and Martin Tyler. In fact, Sky produced a completely separate edit for the game. Using eight 3D camera rigs (16 cameras in all) the feed was mixed so that the slow motion used suited the 3D footage better and some of the angles – corner of the goal-posts – were not used in the traditional broadcast. Eight cameras are not enough to bring you all the angles you want from a football match. We have been spoilt in recent years with the sheer amount of cameras on-hand in a normal HD match that it is noticeable that some areas of the action were not being filmed (the dugout etc) and this meant that wide shots were used for the majority of the game – a shot which doesn't do 3D justice. One of the biggest bugbears for watching Sky on 3D is the glasses. There's no getting around it, putting on the specs adds an extra barrier to the live action you are watching. You have to ask yourself: would you watch a crucial game in the World Cup in 3D, knowing that the technology is still playing catch-up? Saying that, close-up look great in 3D and when the technology used – passive 3D, with a polarising filter built into the TVs – comes to the home this summer (at no extra cost, as long as you have a Sky HD subscription) there will be a feeling of immersing yourself in the game. This is something that's difficult to do in a crowded pub, when the six-foot Arsenal supporter in front of you tries his best to obscure your view. In the end, it was the superb display by Man Utd which ended up being the star of the game, not the technology. We can't help thinking that Sky would have wanted the match to be a 0-0 draw, so that the talk of the pub was around 'is 3D the future?' and not Rooney's right foot. In the end, it wasn't.